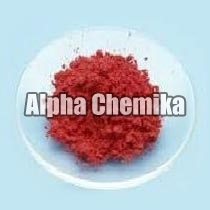 Red Mercuric Oxide is bright red powder metal oxide. Customers can avail from us Red Mercuric Oxide in that is completely free from impurities. Red Mercuric Oxide is used in the synthesis of a mercury based superconductor. Also, it is used as antiseptic in pharmaceuticals, component of dry cell batteries, pigment and glass modifier, fungicide, preservative in cosmetics and analytical reagent. Moreover, Red Mercuric Oxide is light sensitive and highly toxic by ingestion, inhalation or skin absorption.